This is the ONLY certified United States Marine Corps Non Commissioned Officer Saber Sword that is manufactured in the world sword capital of Toledo Spain. These beautiful USMC NCO sabres are manufactured by Bermejo of Toledo Spain, the leading producer of military swords since 1910. These swords have been certified by the USMC to meet the specifications per Marine Corps Technical Manual TM10120-15/2 and the certification number 820 is etched on the spine of the blade. The Bermejo Toledo Spain logo is etched on the blade just below the hilt to assure you genuine Toledo Spain quality and production. The Bermejo US Marine Corps NCO sword is manufactured with MIL-S-19206 specifications meeting highly polished class 2 stainless steel blade appropriately etched. 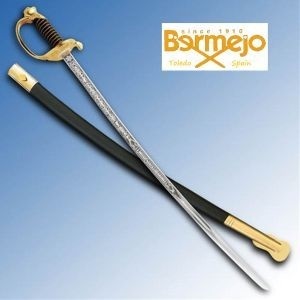 The hilt ,scabbard and every detail are meticulously produced according to government specifications as well as the high standards of Bermejo.